Lying in a hammock, under a palm tree, overlooking the Caribbean sea, I thought, I must be doing something right. I was back in Tulum on the Yucatan Peninsula of Mexico for Day of the Dead 2017, which also happens to be my birthday. This time it wasn’t my idea to go to Tulum, my husband was attending a conference on blockchain technologies in Cancun and I was along for the ride. Before I left I had found my way to Arcatus Books in Totnes, a fantastic bookshop for all things esoteric and beautiful. 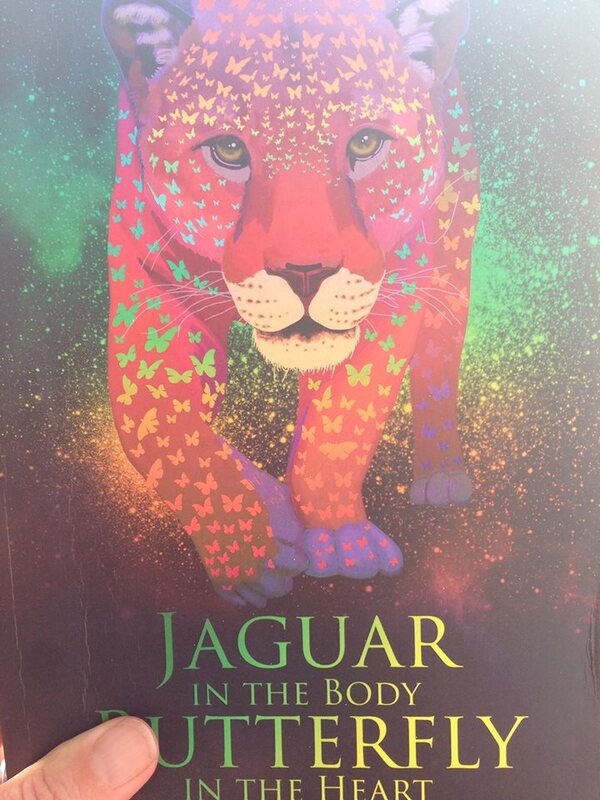 I asked for the book I went in for and just as I was about to pay my eye settled on the cover of Yacov Darling Khan’s new book “Jaguar in the Body, Butterfly in the Heart”. The cover illustration is one of the most beautiful and resonant images I have ever seen. Full of power and reminiscent of the Om Padma lotus print. Yacov’s tale of his shaman’s journey is captivating. Full of magic and wonder, not for the fainthearted as he describes the rituals of becoming acquainted with death. As I read I became aware of the jaguar energy around me. We were staying in cabanas on a rocky outcrop on Tulum beach. The rocks were said to be on top of underground caverns where Mayan priests from the nearby settlement of Tulum mediated. Whether it was that or my own medicine journeys in Peru, the jaguar claimed me.